The Dunlin is the commonest small wader on The Wash, and is easily identified by its distinctive down-curved bill. In winter, it is a largely drab grey bird, but its summer plumage is distinctive with richly patterned upperparts and an extensive black belly. Like the Knot it sometimes gathers in large flocks which swirl over the beach at high tide. Dunlin have a complicated population structure, with three races visiting The Wash. 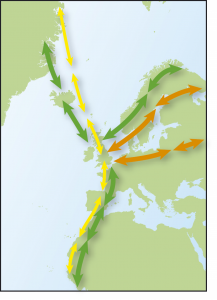 Birds of race schinzii (green arrows on map) breed on the moors of Britain and Scandinavia and migrate through The Wash in August and early September to wintering grounds in west Africa. Birds of race alpina (orange arrows) breed in northern Scandinavia and Russia and winter on Tthe Wash. Birds that breed in Greenland (race arctica, yellow arrows) pass through The Wash in small numbers each year, also on their way to Africa. © BTO, from Time to Fly by Jim Flegg. Although Dunlin are primarily winter visitors they can be found on The Wash almost year round. 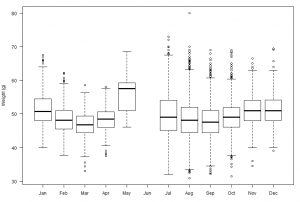 As the graph below shows, although some Dunlin are caught on The Wash all year round, most are caught during the autumn passage period of July to September. The number of Dunlin caught on The Wash, by month, between 1985 and 2016. Dunlin are probably the commonest wader on The Wash and they can be seen almost anywhere, and at most times of year, though they will be scarce in the summer (May to early July). Dunlin feed on small worms, crustaceans and molluscs on the mud’s surface or, more commonly, just below it. They detect prey by touch, and like many waders exhibit the phenomenon of ‘rhynchokinesis’ whereby they can open just the tip of their bill, allowing them to swallow prey buried in the mud. 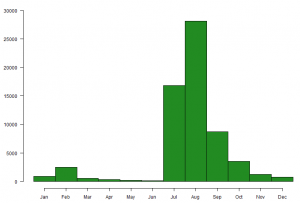 As the graph below shows, the number of Dunlin caught each year varies. Some annual fluctuations are related to the success of catching attempts rather than being representative of the number of birds present. 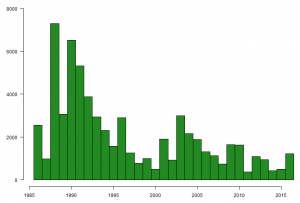 The number of Dunlin caught on The Wash, by year, between 1985 and 2016. The longevity record for the oldest Dunlin to be ringed in Britain & Ireland stands at 19 years 3 months 26 days. 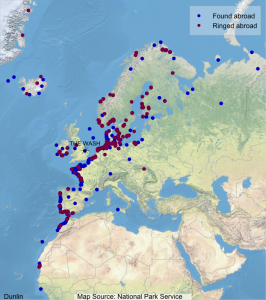 The following map shows where Wash-ringed Dunlin have been found abroad (blue dots) and where foreign-ringed birds that have been encountered on The Wash were ringed (maroon dots). The graph below shows the average weights, by month, of Dunlin caught on The Wash between 1985 and 2016. The thick horizontal line gives the average weight and the box indicates the middle 50% of weights. The thin vertical lines indicate the range of observations, with the circles identifying the most extreme values.